WASHINGTON -- More than 1,000 activists descended on JPMorgan Chase's annual shareholder meeting Tuesday, according to community organizers present at the event, demanding action on the company's foreclosure practices and calling for an end to the company's investment in a company promoting genocide in Darfur. 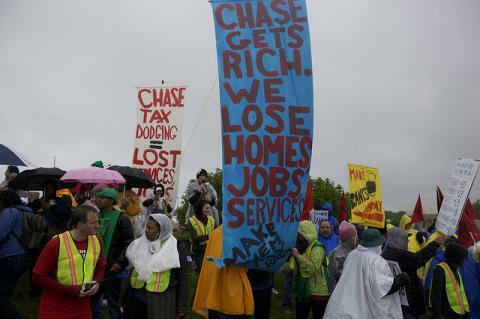 Neighborhood activists, religious leaders, outraged homeowners and political activists presented the company's shareholders with stories of alleged abuse and neglect by JPMorgan Chase, particularly from Chase's mortgage wing, according to activists present at the event, who provided HuffPost with several photos. 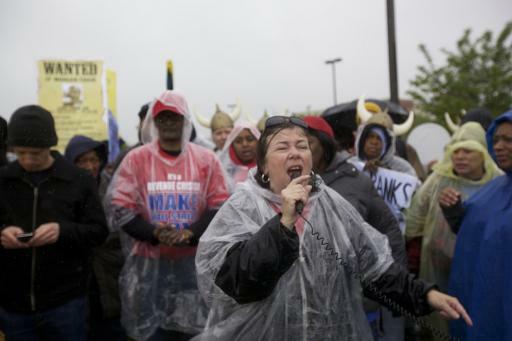 The shareholder meeting and demonstration were held at a JPMorgan Chase building in Columbus, Ohio, a city ravaged by the foreclosure crisis and heavy unemployment. George Goehl, Executive Director of National Peoples' Action, a coalition of anti-foreclosure activists, said his group briefly blocked all five entrances to the building in an effort to disrupt the shareholder meeting and show their outrage over Chase's foreclosure policies. Goehl said NPA had bused in two separate groups of 500 activists, mostly from midwestern states. One of the biggest subprime lenders during the housing bubble, Chase has been immersed in legal troubles associated with foreclosures, facing accusations that the bank improperly 'robo-signed' thousands of foreclosure documents and defrauded taxpayers. Federal banking regulators slapped the company and several other big banks with a consent order requiring it to review its foreclosure practices, although fines have not been issued. The company has apologized for illegally foreclosing on the families of active-duty military members fighting in Iraq and Afghanistan, and a set of confidential federal audits accuse the company of abusing the Federal Housing Administration by deploying faulty documents when seeking reimbursement on foreclosures of government-guaranteed loans..
At today's meeting, dozens of activists dressed in Robin Hood costumes used a plywood bridge to cross a series of ponds that partially surround the building. 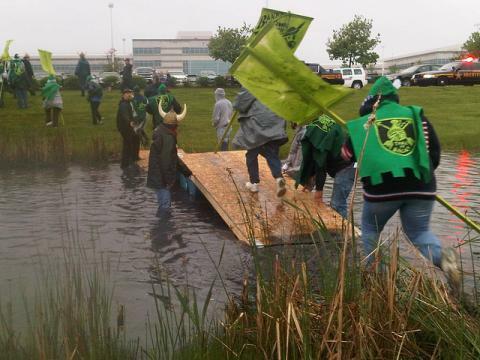 Protesters then placed model homes into the water, letting them sink in a demonstration against Chase's foreclosure practices. Inside the shareholder meeting -- webcast by the bank and monitored by HuffPost in Washington, D.C. -- homeowners presented bleak stories that stood in stark contrast to CEO Jamie Dimon's opening comments, which touted the company's dedication to its customers, boasted of $17 billion in annual profits and bemoaned the overregulation of large American banks. Virginia Holwell, a 59-year-old shareholder from Peoria Heights, Illinois, even brought her own mortgage paperwork to the meeting to request help. Speaking to the gathering of shareholders, Holwell said she went to Chase to ask for a loan modification after losing her job a year ago. Howell said the company has lost her paperwork five times but has urged her not to go seek legal aid, housing counseling or advice from other parties. In March, after stringing her along for over 10 months, Chase advised her to "liquidate the property." "I'm one of those customers you were talking about Mr. Dimon," Holwell said. "I'd like to retire in my home. I brought my paperwork with me. Can you amend my mortgage?" Anticipating a heavy volume of mortgage complaints at the meeting, JPMorgan set up a consumer specialist desk to field inquiries, and Dimon responded to Holwell's testimony by directing her to the desk. In a telephone interview with HuffPost following the meeting, Holwell said she was happy with the way the event worked out. 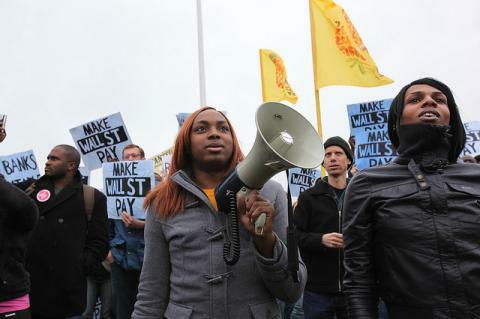 "I think we really got our points across to Jamie Dimon and the shareholders," she said. Holwell said she has lived in her home for 10 years, but lost her job as a social worker with the Illinois Department of Family and Children's Services one year ago today. She said that Chase reviewed her documents today and gave her the direct phone numbers of a specialist in Chicago and that specialist's boss to see what can be done for her. "I had the opportunity to bring my paperwork to the meeting but hundreds of thousands of people in the same position aren't in the position to directly ask Jamie Dimon to modify their loan," Holwell continued. "Has it come to this -- that the customer has to find the CEO to get a response? That isn't how American business should run." "This is kinda classic Chase," Goehl told HuffPost. "One of the women who gave testimony today -- they're fixing it now. They're not doing anything for thousands of other people, but that one woman is getting help, at least." CUFA Board member Melowese Richardson said after Chase abandoned the property without transferring ownership records into the company's name after the company foreclosed on her home. As a result, the local government pursued her for not taking care of the the home. "Not only did you foreclose on the house anyway, you simply walked away from it, a house that's been in our family since 1963. When you walked away from that home, you left me with charges from the city facing jail time or healthy fines for a house that Chase took from my family," Richardson said, as her fellow shareholders applauded. "The schools, even the churches were foreclosed on," said CUFA President Roger Davis, who noted that parts of Cincinnati are now "like a ghost town." "Fix these loans," Davis said. "Keep people in their homes. Take care of the vacant property that you own." "We got to let him know what was happening to our communities, the condition of our communities, from these foreclosures," Davis said. "And Jamie Dimon acknowledged us, which is a victory in and of itself." Davis, who has run CUFA for a decade, said it has been difficult to get a response from banks about both foreclosures and property abandonment -- neither of which have improved in Cincinnati despite a longstanding public outcry. "I think it was really important that the individual who was with him did not speak to us, it was Jamie himself." During the meeting, a representative from the California Reinvestment Coalition presented shareholders with the results of a survey it conducted among housing counselors in that state showing that 70 percent of counselors rated Chase "bad or terrible" at helping people avoid foreclosures where it was possible to actually avoid it. "There's a big disconnect between what Chase presents in what they're doing around mortgage servicing and what takes place on the ground," said Josh Zinner, co-Director of New York City's Neighborhood Economic Development Advocacy Project, during the meeting, claiming that the company has "some of the longest delays of any servicers in working with borrowers to get answers" and "some of the highest complaint rates." Zinner said Chase could change its foreclosure practices or continue to be a "symbol of everything that's rotten about the big banks." "Like most companies, we do make mistakes and we think it's important to acknowledge those mistakes," Dimon said. "There is no class of citizen that we hold in higher regard, there is no mistake that we've made -- this is the worst one we've made," Dimon said. "We deeply apologize to our veterans." Another Chase official said that the wronged veterans had been given back their homes free of debt. Like the owners of several other banks this year, JPMorgan's shareholders at today's meeting were asked to vote on a proposal that would require the bank to review its practices surrounding foreclosures. The proposal, advanced by several religious groups, would require the company to provide the same mortgage servicing standards to loans that it handles for investors as it uses for loans it actually owns. The company's board opposed the measure, saying the bank already implements the same policies for all of the loans it handles in its proxy statement. Several other proposals were also considered, including a proposal to reevaluate the company's relationship with the U.S. Chamber of Commerce, a proposal to disclose all of the JPMorgan's political spending and a proposal to block the company from investing in enterprises that promote genocide. The anti-genocide proposal was prompted by Chase's investment in the PetroChina oil company, which human rights advocates have long accused of financing the genocide in Darfur because its parent company is a substantial oil producer in Sudan. "There is no compelling justification for these investments," said William Rosenfeld, founder of Investors Against Genocide, at today's meeting. "Chairman Dimon says, 'We have always been committed to being good corporate citizens.' So why does the company's board oppose this proposal?" The company's proxy statement says the company's policies already address Rosenfeld's complaint.